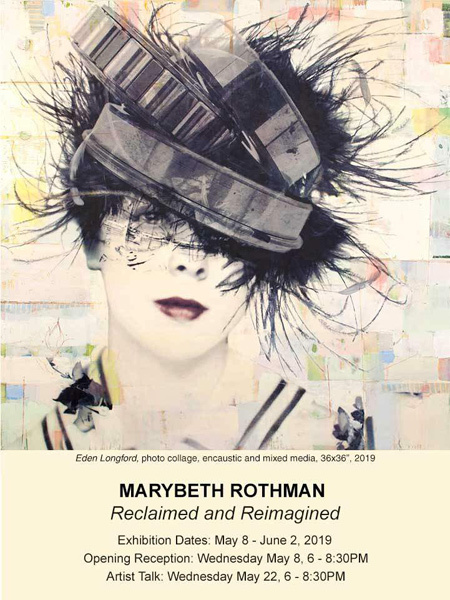 REIMAGINED, an exhibition of mixed-media encaustic paintings, a confluence of figuration and abstraction, by New Jersey based artist Marybeth Rothman. compositions of carefully layered encaustic paint, a luminous pigmented beeswax, creating a visual depth that is unique to its medium. The fluidity of the process and its integration of encaustic, photography and collage that occurs simultaneously-enables a poetic dialogue among these materials also thematically. Rothman, as a storyteller, moves freely between the mediums of her semi-abstract portraits of re-imagined strangers- her concept, originally sparked by rediscovered vintage family photos from the 1940's, and presently supported by collected vernacular photography from the same era. Initially inspired by facial expressions and postures of actually depicted, to her unfamiliar subjects, Rothman starts with an underlying abstract composition - her palette, lines and marks rewrite and transcend the early narrative and convert the physical attributes of her materials to become one tool to paint fictitious narratives of her own imagination. Both additive and subtractive, Rothman's mixed media practice, generally employs many subtle layers to form an amalgam of content and texture, leaving ample room for abstraction, clearly revealed in her recent formally abstract paintings in this exhibition.Conceptually and technically, Marybeth Rothman's work manifests itself at the convergence point of inspiration and actual creation: Concerned with her distinct narrative, partly subjugating her mediums to the ideas of a storyline, while probing and exploring the abilities of her materials, Rothman, akin to a biologistis aware that any modifications can transform the DNA of her medium, and change the visual outcome of her mind's eye. Marybeth Rothman's Solo Exhibition RECLAIMED & REIMAGINED is on view at Mark Gallery@Lichtundfire Wednesday through Saturday noon - 6 pm, & Sunday 1 - 6 pm. Arielle Mark at mark-gallery@optonline.net, 201-978-9196, or visit mark-gallery.com.